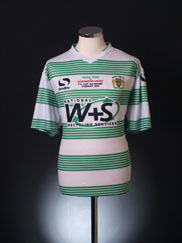 The Glovers kits have been a combination of green and white since they started out in 1895 when they were known as Yeovil Casuals. The green and white hoops have been around since 2003 but prior to that green and white has been used in just about every combination imaginable for a football shirt. Stripes between 1991-1995, white shirts with green shorts, and green shirts with white shorts, all white, and all green, and of course some interesting styles in the late 90s.